A button up top, these boyfriend jeans and heels seems to be my go to outfit lately. It is just easy and comfortable. I love this top. It is chambray and it comes in a bunch of fun Spring colors. I can never have to many button up tops in my wardrobe. I live in them and I really just loved the color of this one for Spring. It will be cute paired with white skinny jeans as well. Beautiful casual chic. Esp. love the cute top! Looking great in this laidback outfit! I love this look!! Hope you have a great weekend! Love this look :) I adore your blog your style is impeccable! I am impressed that you are still in heels. :) This outfit is so cute and perfect for a stylish mom. You look amazing! I wish I had your good genes! I adore your perfectly polished looks. I keep seeing this top from Halogen in all these different colors... I think I need to get it! You look absolutely fabulous! love the look, it has such a fun laid back vibe while still being put together. In love with that chain necklace! I can't believe you just had a baby! You look amazing! You look amazing after had a baby! Love the look! I can't even believe you had a baby a month ago...you seriously look amazing!!! Adore this look! I'm going to order both the top and jeans!! You look gorgeous! You look amazing as a new mom, so polished & chic! I love that color, it's so perfect for spring! You look great! Love those jeans! You are looking amazing! That pink top is perfect! Amazing look! 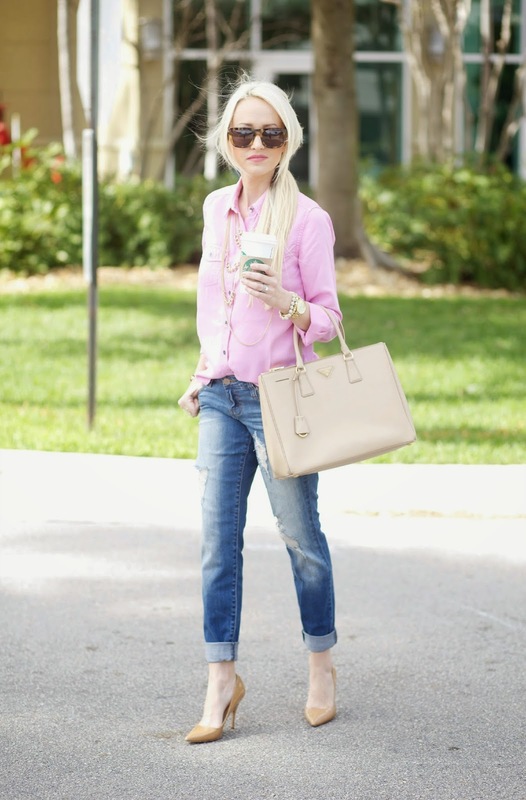 Love the pink shirt and how you styled it!